Akarua kitchen and cellar door. Douglas Renall has walked the vineyards, searched the cellars and talked with winemakers and vineyard managers to gather fascinating insights shared in his new publication 100 Great New Zealand Wineries. Akarua ('two vines' in Maori) is considered the largest family-owned winery in Central Otago. The winery specialises in Pinot Noir and cool-climate white wines, but its new range of NV Methode Traditionnelle wines have become the talk of the town and are now regarded as some of New Zealand's finest. Akarua isn't shy when it comes to winning awards. The Methode Traditionnelle wines have won numerous trophies and gold medals over the last few years, and the Akarua Pinot Noir has won the trophy for Champion Pinot Noir at the New Zealand International Wine Show three years in a row. Akarua is located in the rocky Cromwell Basin. Take Bannockburn Rd south over the bridge and make a left turn on to Cairnmuir Rd before following the winding road for a few kilometres until you come across the winery on your right. The new cellar door was opened in 2010 and is a must-see when visiting Cromwell. 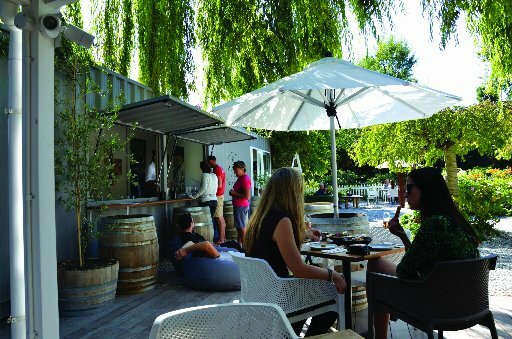 Akarua also established a second cellar-door restaurant in 2016 at Walnut Cottage, between Arrowtown and Lake Hayes. This new eatery is called Akarua Wines & Kitchen By Artisan, and is sure to become a new wine and food mecca. The original 48-hectare vineyard was planted on Cairnmuir Rd by Sir Clifford Skeggs in 1996. The vineyard overlooks the Kawarau River and is planted on free-draining, low-nutrient alluvial sand and schist soils. Today, the vineyard is managed sustainably by Mark Naismith, who knows the pinot noir, chardonnay, pinot gris and riesling vines like the back of his hand. Two new vineyards were purchased in 2014. The 21-hectare Felton Road vineyard is planted predominantly in pinot noir, and another 14-hectare vineyard in Lowburn is 100% pinot noir. A further two Central Otago vineyards were snapped up in 2016, bringing the total vineyard area to more than 130 hectares. The state-of-the-art winery was built in 1999 and was designed to cope with 300 tonnes of fruit. It has a red and a white barrel room and the technology necessary to keep the temperature and humidity at optimal levels. The emblem of the Akarua winery is an endangered alpine daisy called Celmisia semicordata. Akarua has an ongoing commitment to this plant's survival in Central Otago.
. . . the largest family-owned winery in Central Otago. Andrew Keenleyside was recently promoted to chief winemaker in 2015 after having been assistant winemaker since joining the team in 2009. He worked vintages in California, Germany and Oregon before moving to Central Otago to put down some roots and focus on creating world-class Pinot Noir and sparkling wines. Akarua produces two excellent Pinot Noir wines, namely Akarua and Rua. Akarua Pinot Noir spends 10 months in French barriques (30% new) before bottling. The wine is pure, balanced and earthy with ripe tannins, juicy dark-fruit characters and a lick of sweet oak. The lush, fruit-forward Rua Pinot Noir is aged in French oak barriques (10% new) for six months, bringing subtle, savoury and spicy oak characters to the wine. There is also a Rua Pinot Rose made from 100% pinot noir grapes and bursting with classic strawberries and cream characters. The Akarua sparkling wine selection includes an Akarua Brut NV Methode Traditionnelle, an Akarua Rose Brut and an Akarua Vintage Brut. All three are extremely elegant with the two Methode Traditionelle sparkling wines having lovely Champagne-like qualities. The Akarua Pinot Gris is made from 15-year-old vines and is fermented in both stainless-steel tanks and oak barrels. The wine often displays lovely richness and creaminess with white-peach and orange-peel elements showing through on the nose and palate. The Rua Pinot Gris is a great entry-level wine, displaying juicy ripe fruits. The Akarua Chardonnay is full-bodied and lush, while the Akarua Riesling shows great balance and elegance. And the Akarua Sauvignon Blanc is textured and lingering on the finish. The Akarua Alchemy Ice is made from gewurztraminer (53%) and riesling (47%). It is a rich wine, with spoonfuls of spice, apricot and ripe melon nuances.